This page contains other websites about politics that provide statistics, facts, and non-partisan research. Stay Informed and Return to truthfulpolitics.com! 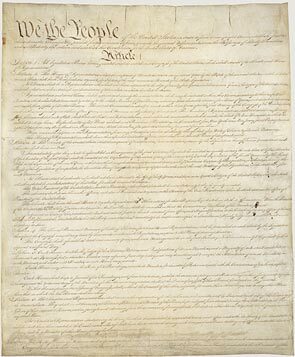 The National Archives website has official images and text of the Constitution of the United States. The Constitution and other official documents may be read by clicking on The Constitution of the United States: A Transcription. The Federalist Papers were written in the late 1700s to promote the ratification of the U.S. Constitution and included details on sections of the Constitution. To read the essays, click on The Federalist Papers on THOMAS of the Library of Congress or The Federalist Papers on the Founding Fathers website. To read the entire farewell address from 1796 by George Washinton, the first president of the U.S., click on Washington’s Farewell Address 1796 .
http://www.opensecrets.org also known as the Center for Responsive Politics. You Decide, created by KQED and funded by the Corporation for Public Broadcasting, provides information and different sides on several issues. The website may be found by clicking on You Decide: Challenge your assumptions. Gallup's "State of the States" series reveals state-by-state differences across several political, economic and wellbeing measures which Gallup tracks daily.